"What kind of guardian are you? Shouldn't you have gone to the bathroom with him?" Isabelle demanded. Jordan looked horrified. "Dudes," he said, "do not follow other dudes to the bathroom." Okay. So this is going to be a long one, guaranteed. I'm sorry to say I was the teensiest bit disappointed with the premise of the story. It's really impossible for me to count the number of books I've read that involve guy-shies-away-from-girl-because-of-some-internal-reason cliché, and now I have to add another to it. I would have been really offended if I were Clary through most of the book, but when you do find out why Jace is avoiding her, he actually does have a pretty legitimate reason. Not like other books I've read, haha. The story mainly, to me, revolves around Simon. Funny that I didn't know his last name until I read this... he's establishing himself more and more in the nature of being a vampire, and at the same time trying to live a normal life—being in a band, living with his mom. But there's just that one little complication: the Mark on his forehead. Puts a dampener on a lot of things for him. Shadowhunter interest, vampire interest, and apparently vampire hate too. Basically a long chain of vampires are trying to get to Simon, because he's a Daylighter; but his Mark protects him. So, this arc... I did enjoy it. I really enjoyed reading for Simon, but I was really speeding along because I was more eager for Clary's point-of-view. Simon just seemed a little ignorant to me for a lot of the book. Not to mention, he makes a lot of cruddy mistakes all at once that NO normal guy would EVER consider making, even one at a time. Or vampire mistakes too. It kind of took away a bit of my affection for him, unfortunately; I can gladly say some of it returned by the end of the book, but it's just not the same. Meanwhile Jace and Clary struggle with their own problems. Jace is avoiding her, as I said; and Clary is patiently waiting for him to decide when he's going to tell her what the matter is. She follows through with Shadowhunter training, not that she does as much training as she does making out, exactly. Jace is still trying to find out more about his real father, so Clary makes the assumption of his avoidance being about Valentine. I really loved Jace's point-of-view. It was more real to me than any of the other characters through CoFA. I've always felt like Jace was the most realistic person of the entire book, and I'm glad it remained that way in Book 4. There's a point when it talks about Jace constantly repeating one line to himself, until all meaning of that phrase is lost but he just keeps thinking it in order to make it real. I LOVED this, mainly because I know that it's something that actually happens to people (me, for instance). Cassandra Clare made a beautiful, beautiful depiction of the distress there. Meanwhile Clary is trying to juggle both Simon's problems and her own. Not a good advisory. She gets a little overwhelmed, which means she has to take time away from what she really needs to be concentrating on and only sees parts of the main picture, less than she usually does. Her POV is just as interesting and in-depth as it always has been, but I was just the slightest bit disappointed. For the *insert number here*th time. Maia returns, as well as Isabelle (who, I am SO GLAD to say, still is and always will be my favorite character. I love Isabelle). Luke and Clary's mom are engaged, thank God—I've waited for three whole books for them to tie the knot, and at last they're getting there! Alec and Magnus are on vacation for most of the book, but halfway through some events regarding Simon have need for Magnus' intervention, and it puts a rod in their relationship. Magnus clears everything up in the end, though. Which makes me happy. 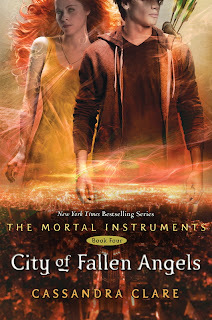 Their characteristics are still the same; they're all still just as lovable as they were in City of Glass. I'm trying as hard as I can to prevent spoilers, but I'm not sure how well it's working. I will say we do get to meet another Greater Demon, one who sent shivers down my spine. Though I didn't care for the plot, Cassandra Clare still writes everything beautifully; her descriptions are unmatched, and the dialogue is fresh and interesting. She juggles a lot in this fourth installment, and she does a pretty good job of evening it all out. She still succeeded in making an ending that made me both satisfied and angry at the same time, so points for that. In conclusion, I was satisfied with City of Fallen Angels—but, in my honest opinion, I really think that she could have just left it unwritten. The ending of City of Glass was a better ending to me. I was satisfied, but disappointed (again). Don't let this put you off—it's still a really, really good book; and it raises some questions that I'm eager for the answers to. The book was lovely, I'll give it that. But that's all I'll give it. As for the entire series? To everyone: I'm sorry I haven't been putting ANYTHING on here. My finals are coming up for the end of the school year and I haven't had time. ): I'll try to put another post of some sort up tonight to make up for it! Love you guys!